The durable goods report is a hard data report that gets plugged into the GDP calculation, so it is important. The headline number for April missed estimates, but the core orders were strong. New orders were down 1.7% month over month which missed estimates for a 1.2% decline. The prior report was revised up from 2.6% growth to 2.7% growth. The big reason for the headline swing was that aircraft orders fell 36.2% month over month which followed March’s 71.7% increase. It’s not that we shouldn’t care about aircraft orders, it’s that the wild swings don’ t tell us anything about the strength of the economy. On the bright side, defense orders were up 7.5% and vehicle orders were up 1.8%. It will be interesting to see if those vehicles will be sold given the uptick in auto loan delinquencies and the rising rate environment which will increase monthly payments. The ex-transportation capital goods orders were up 0.9% which beat the consensus of 0.6% growth. The prior revised growth was up from 0% to 0.4%. Even though the headline number was weaker than March, it was a stronger report. The core capital goods were up 1% which beat the consensus for 0.7%. The March report was revised down from -0.1% to -0.9%. There was an improvement in the dollar totals of the primary metals which the tariffs helped create. The orders for primary metals were up 1.3% in April which was in addition to the 4.6% growth in March when the tariffs were implemented. Orders for fabricated metals were up 2% which followed March’s gain of 1.2%. These two groups are 20% of total durable goods orders. Fixed nonresidential investment was up 0.8% and unfilled factory orders were up 0.5%. These are all great signs for Q2 GDP. Even though this was a great durable goods report, the headline number caused GDP estimates to drop slightly. I would rather the April report over the March report because core orders show underlying strength in the economy, but the volatile aircraft orders affect the number plugged into GDP so we get slight weakness in the estimates. The CNBC GDP tracker fell from 3.5% to 3.4%. The St. Louis Fed GDP Nowcast is the most optimistic at 3.63%. The most pessimistic is the New York Fed which fell from 3.2% to 3.01%. The decline was caused mostly by the durable goods report as it had a -0.19% impact. The new single-family houses sold had a -0.03% impact. There are still 10 more weekly updates, so this has room to change. 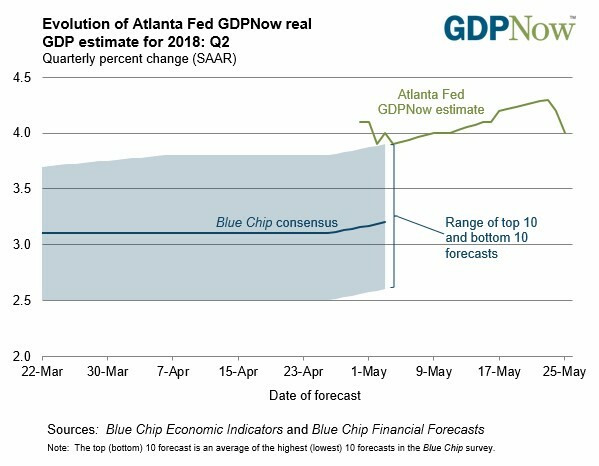 The Atlanta Fed Nowcast, seen in the chart below, shows the Nowcast estimate declined from 4.1% to 4%. The real residential investment growth estimate fell to 1.1% after the existing home sales report. The existing home sales report was 5.46 million which missed estimates for 5.6 million. It was below the lowest estimate. There was a 2.5% month over month decline and a 1.4% year over year decline. Usually, the Nowcast starts falling a few weeks after the initial estimate is high, so it’s looking good this quarter. I expect it to move up after the ISM report is released this week. The jobless claims report increased 12,000 a week ago and 11,000 last week which is a sharp upturn. Even with these two increases the claims are below where they were in April, which means the May jobs report will be strong. Given the fact that economic growth is strong, I wouldn’t be surprised to see improving wage growth. The current consensus is for 185,000 jobs created which is above the 164,000 jobs added last month. Average hourly earnings are expected to increase 0.2% month over month and 2.7% year over year. As you can see in the chart below, the ECRI index growth rate has slipped to 3.5%. That’s a worrisome sign about future growth later this year and early 2019. I’ll be on recession watch starting in the middle of 2019, so I take any future leading index’s weakness seriously. The next bout of weakness probably won’t lead to a recovery like how the weakness in 2016 led to strength in 2017 and 2018. Some retail investors might be tired of the stock market’s sideways action because they had gotten used to record highs being hit constantly last year. I think 2017 was like 2008 in that it’s unlikely to be repeated anytime soon. Obviously, 2008 was to the downside and 2017 was a great year for risk adjusted returns. Don’t let boredom ruin good returns this year. Investing can be fun at times, but the principle goal isn’t entertainment. 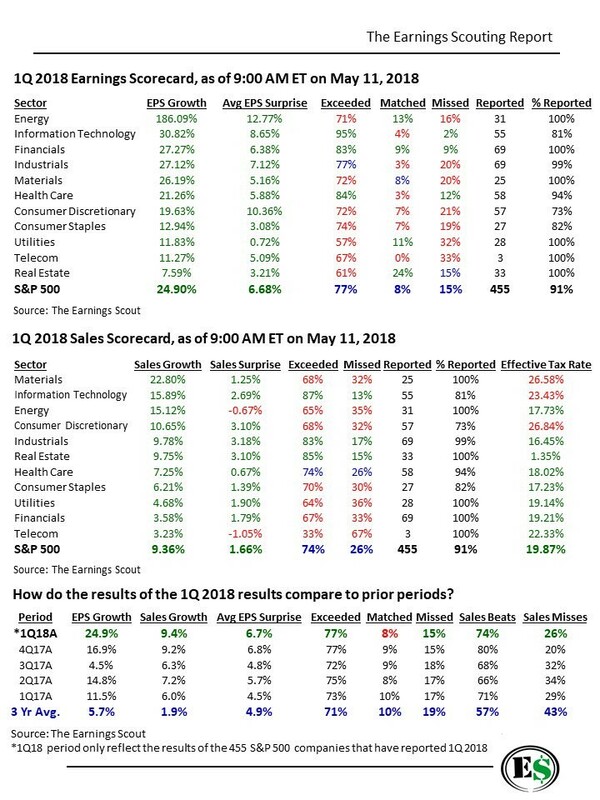 As you can see in the chart below, with 486 S&P 500 (SPX) companies having reported Q1 2018 earnings, EPS growth was 24.8%. The way the chart presents the data is interesting as it says the Fed’s tightening was bailed out by the ECB. The Fed didn’t have nearly as tight policy in 2015 as it does now. I think the current tightening spree is being bailed out by the tax cuts. If those thoughts are true, then the Fed can never truly tighten rates because the economy can’t handle it. To be clear, I think the economy is strong now and was weak in 2015 because the tax cuts have a much stronger effect than the ECB bond buying program. The sales growth chart shows Q1 growth is 9.1%. It shows stocks struggled in 2015 when revenue growth was negative and now they are rallying because of the rebound. In early 2016, I was bearish because of the revenue and EPS declines, but that ended up being a great time to buy because of the turnaround. You can debate whether this year signals a similar turnaround, but in the opposite direction. I think the entire year will be solid. According to the Earnings Scout model, there’s a 91% probability Q2 earnings growth will be in between 20% and 25%. Being bullish now certainly is taking the leap of faith that future growth is solid. I’m confident in taking that leap.